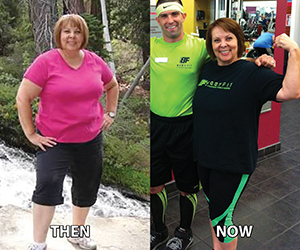 Cal Fit Success Story: Arden Member, Eileen R.
Before I started Body Fit at California Family Fitness, I felt slow and tired… I just wanted to hide. I finally decided that it was time to focus on my goals and get serious about being healthy, strong and losing weight. Participating in Body Fit has changed my life. The Certified Personal Trainers are wonderful and really help you achieve your fitness goals. It’s hard work but so much fun. To date I have lost 40 pounds. When I first started, I couldn’t do a burpee. Now I can do 15 of them within 90 seconds!